As a college student that is health and budget conscience, I am always looking for something that meets these requirements. The best way to do so, is to make something yourself. One of my favorite dishes is Ahi Poke. Ahi Poke is a dish that is enjoyed by many, but made by few. It consists of fresh raw tuna mixed with a few seasonings. Besides being so tasty for how simple it is, it also is very healthy. 4 ounces of tuna (Yellowfin tuna) itself yields about 27 grams of protein in just 123 calories. It’s a great source of lean protein. While the ingredients are simple, some people are a bit scared of handling raw fish, but it’s really no different then another other meat. In fact, most fishmongers at any fish market or fish department will clean the fish and hand you a perfect fillet that is ready to be used for a meal. The only real important requirement for this dish is to have the freshest tuna possible. 2. Take the ¼’d avocado and take the seed out and peel the skin off. Cut into to small ¼ inch pieces. 3. Cut the cucumber in slices. You want them thin, but still thick enough to carry the weight of the Ahi Poke that will be served on it. 4. Make sure to keep the tuna cold until being handled. 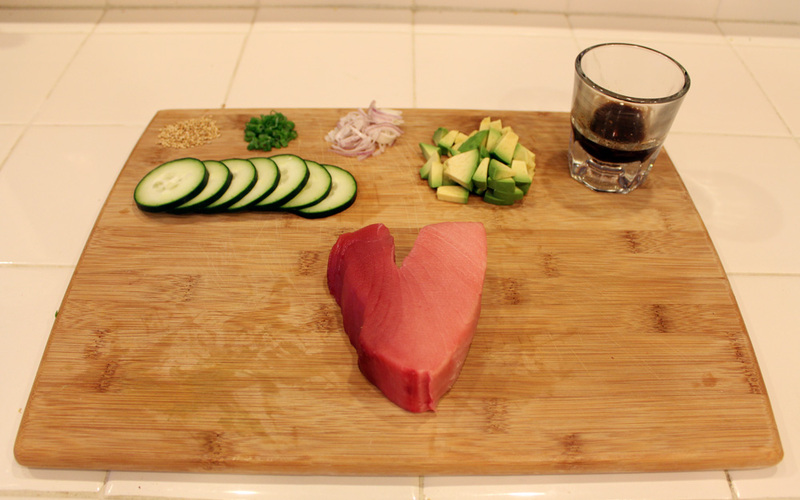 Cut the tuna into ¼ inch cubes. 5. Mix all the ingredients together in a bowl and let sit for about 10-15 minutes. It can be served immediately, but a few extra minutes will let the sauce penetrate a bit better. 6. Top each cucumber slice with about a spoonful of Ahi Poke, serve, and enjoy! What’s great about this recipe is that all the ingredients can be easily adjusted to taste. If you prefer a spicier sauce, just add more of the garlic chili sauce. Big fan of avocado? Add more! 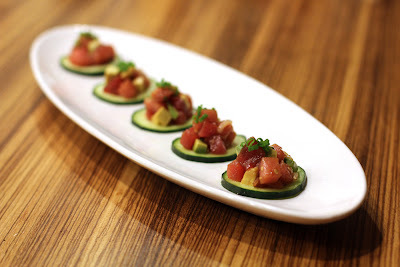 Cucumber is suggested hear as a lower-calorie alternative, but Ahi Poke is also great served on top of your favorite crackers or toasted bread.